To help homeowners who are facing increased deductibles, and other challenges STX Roofing & Construction offers a variety of financing options to our customers. We understand that not everyone has expendable income to pay for the upfront costs of a new roof so we would like to help you finance it. Loans provided by EnerBank USA on approved credit for a limited time. Minimum loan amounts apply. † Repayment terms vary from 15 to 144 months. Borrowers approved for Same-As-Cash loans will pay no interest during the Same-As-Cash period if they repay the total amount borrowed on or before the Same-As-Cash date specified in their Note and Disclosure Statement. 18.10% fixed APR, effective as of September 1, 2018, subject to change. § Repayment terms vary from 60 to 144 months. 2.99%, 4.99% and 6.99% fixed APR, effective as of September 1, 2018. The first monthly payment will be due 30 days after the loan closes and on the same day of each month thereafter. ‡ Repayment terms vary from 12 to 84 months. 0% fixed APR. The first monthly payment will be due 30 days after the loan closes and on the same day of each month thereafter. ¥ Repayment terms vary from 12 to 144 months depending on loan amount. 9.99% fixed APR, effective as of September 1, 2018, subject to change. The first monthly payment will be due 30 days after the loan closes and on the same day of each month thereafter. 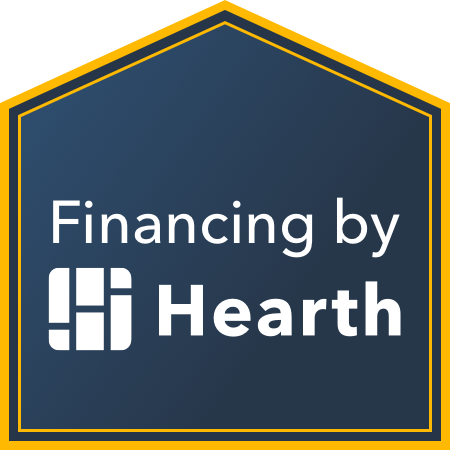 We are also now working with a new financing partner, Hearth!